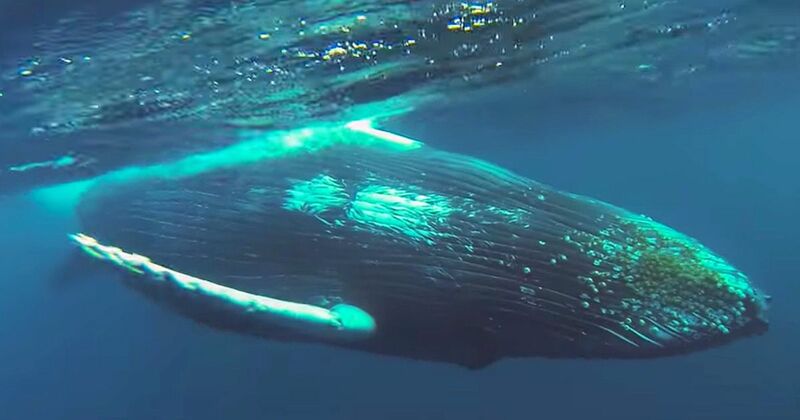 The Professional Association of Diving Instructors (PADI) just released its first video in a series called “IAMA.” IAMA: Humpback Whale is breathtaking. It is several seconds into the video before you realize the star of the show is a baby Humpback. Until he reaches his mother, you just assume that this little critter is the full-sized adult. The realization that they get even bigger is enough to make your head spin. PADI isn’t known for its multimedia presentation skills, and why would they be? They’re all off scuba diving! Apparently, they’ve decided to take marketing to the next level and hired director Aris A. Ford. He’s a big name in marketing, and it shows. PADI is known for its conservation efforts. An important component of their dive training schedule is respect for the ocean and all its creatures. Divers are urged to take nothing out of the water, and leave nothing behind. Scuba diver trash pick-up events and whale rescue squads are the norm. They’ve been spearheading Project AWARE since 1989. Their two main projects are sharks/ray conservation and marine debris. Whales are known to get tangled in marine debris. Sometimes they are rescued, but if no one notices in time they can be severely injured or even die. Whales also eat the many pounds of plastic thrown into the sea each year. Their digestive systems can only handle so much. We only really know about the whales that wash up on shore with trash in their systems, but many others likely perish beneath the waves. It’s great to see PADI making an effort to show everyone the beauty and grace of these magnificent creatures. As the video says: "I am an underwater dancer . . . I am the future of my species."